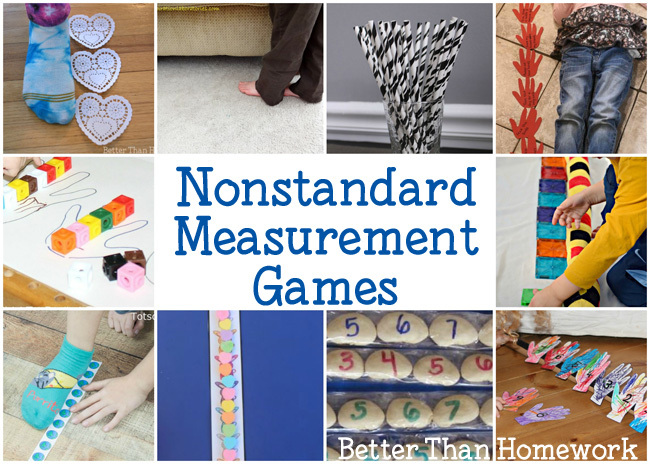 It’s fun to explore measurement with some fun Nonstandard Measurement Games. It’s using an object, other than a ruler, to measure the length or width of an object. So, let’s go have some fun and use our feet, our hands, our toys, or even straws to explore measurement. How Many Hands Tall Am I? at Rainy Day Mum – Make Kind Hands, which are your handprints labeled with acts of kindness, to measure just how tall you are. Nonstandard Measuring with Feet at Inspiration Laboratories – Place one foot in front of the other to measure all sorts of items with this fun idea inspired by Dr. Seuss’s The Foot Book. Fun Body Measurement Ideas with a Piece of String at iGame Mom – Use a piece to string to measure and compare the length of different parts of your body. Measuring with Straws at Life Over C’s – Paper straws are a great tool to use for nonstandard measurement. Use them to measure and record the lengths of different items. Measuring Your Hands and Feet at Little Bins For Little Hands – Use small blocks, such as Unifix Cubes to measure your hands and feet. Handprint Measuring at The Imagination Tree – Use cutouts of your handprint to measure and then make a fun handprint number line with this fun activity. Measuring Length in Nonstandard Units with Candy Hearts at JDaniel4’s Mom – Use candy hearts as a measuring tool with this great activity. Includes fun printables to help you measure. 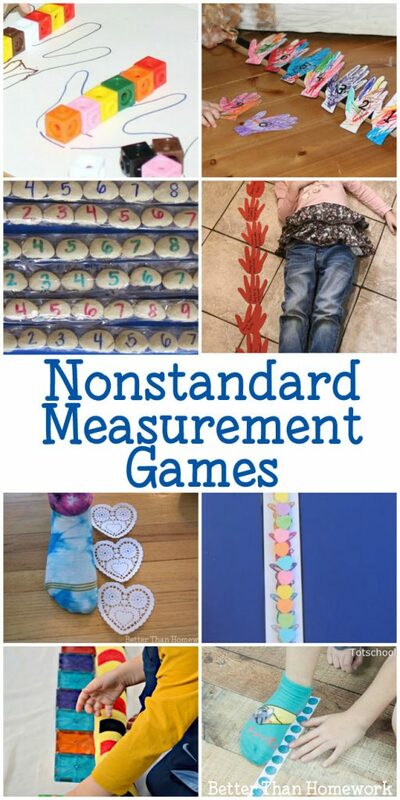 Space Nonstandard Measurement Activity at Totschooling – Use some fun space-themed measurement printables to explore nonstandard measurement. Measuring with Magna-Tiles at And Next Comes L – Do you have Magna-Tiles at home? 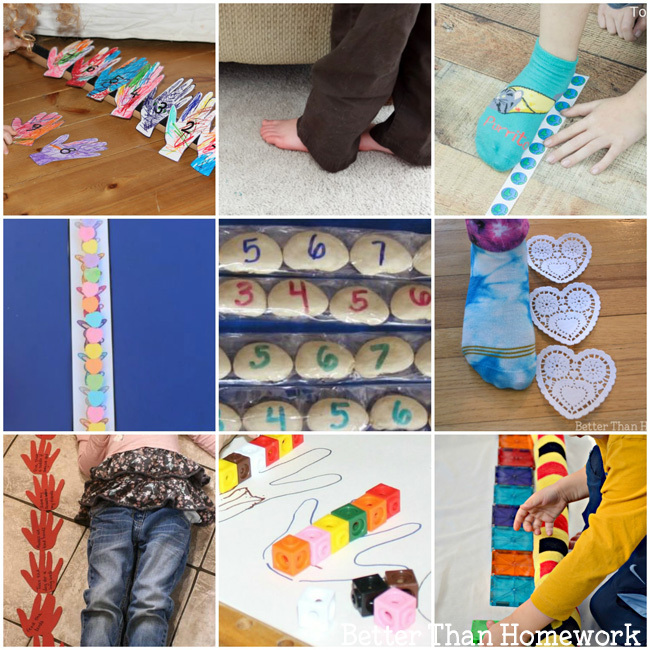 They’re a fun tool to use to explore measurement with this activity. LEGO Measurement at No Time for Flashcards – How many LEGOs tall is your drinking glass? Use LEGOs to explore measurement all around the house. How to Make Bean Rulers at Pocket of Preschool – Make your own ruler out of dry beans to use while you explore nonstandard measurement. Which one of these fun ideas do you think you’ll try with your kids?